Essex Automotive are proud to be your approved Safe and Sound dealership in Essex. 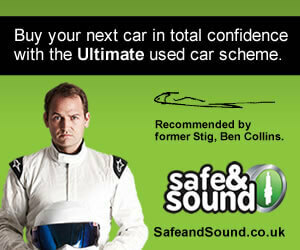 This means that your next vehicle comes with the multi-award-winning Ultimate used car warranty scheme, as recommended by the former Stig, Ben Collins. Vehicle safety inspection - A sixty point safety inspection ensures the vehicle is good to go. Don't leave it to chance - we do the checks so that you don't have to. Full background check - Extensive provenance checks rule out any hidden surprises such as existing finance arrangements or serious accident damage. It's all verified by us. The Ultimate warranty - Voted the best car warranty in the UK. Wear & tear, diagnostics, batteries and even Sat Nav's are just some of the elements included in this cover. Mileage verification - We'll carry out a mileage verification for you to make sure the vehicle's odometer reading is accurate. Buy with confidence. Rescue & recovery - Wherever you are in the UK and with cover for any driver, you're just one call away from assistance 24 hours a day, 7 days a week. Relax, you're covered. Buy-back promise - We even guarantee to buy back your car when you purchase another Safe and Sound vehicle from us, based on age, mileage and condition at that time. I bought a top specification 2014 BMW F31 330d Sport Touring from these guys for 21k The car was perfectly presented and found it super hard to find a single defect on the car to try and haggle with. Although there was some cheaper cars of this model available this car had one of the best specifications and was presented so well I did not mind paying for a premium sales service, that said the car was still priced well without being over the top. My salesman was totally professional and knew his trade which inspired confidence, I knew exactly all about the car I was buying before I arrived and it was refreshing to find a sales person who actually knew what they were selling properly as well. Top car, top salesman, very happy experience, will definitely use them again in the future when I come to change cars in a few years. I have had the car a couple of weeks or so now and not had a single problem of any sort, not even a tiny teething problem.